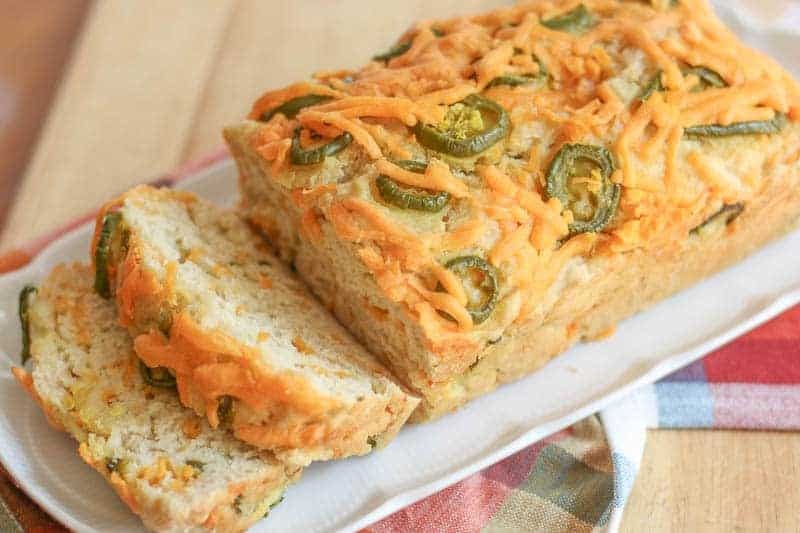 This easy cheesy jalapeño cheddar cheese beer bread recipe makes the best homemade bread that can be made in the kitchen. This bread boasts a cheesy crunchy outer crust, moist on the inside and spicy all around. 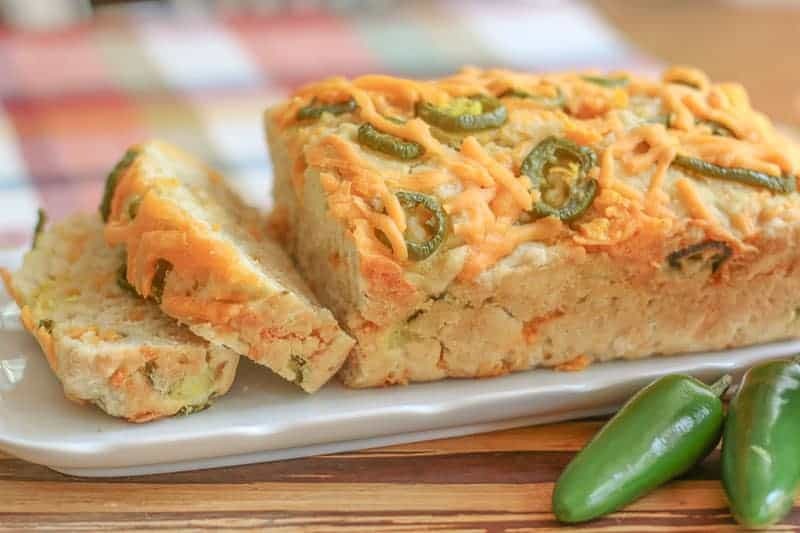 This Easy Cheesy Jalapeño Cheddar Beer Bread Recipe makes some of the best homemade bread that can be made in the kitchen. With a moist center, a crunchy cheesy outer crust, and a salty, slightly sweet and spicy flavor; this bread is delicious by the slice or used for a gourmet sandwich! I was fortunate again to be asked to write an article for City View Magazine in Fayetteville, NC for this year’s Food & Wine Issue. This is their biggest issue, so I was extremely proud and excited to be a part of it. I was asked to create recipes cooking with wine and beer, therefore I created this Cheesy Jalapeño Cheddar, Beer Bread, Port Wine Cheese Ball, and The Best Crockpot Beer Brats and Onions Recipe. I don’t eat a lot of bread in general. Don’t get me wrong, I love homemade bread, but bread loves me back on my thighs and waist. The older I get, the harder it is to shake it off like a bad, physco exboyfriend…. So as a general rule, I only eat bread if it is going to be amazing…. Like a great piece of homemade French bread or a slice of Italian pizza. When writing this article, it was suggested to me to make a beer bread. I was like, “Uh, oh….” I have never made beer bread. I tried to incorporate a local beer to keep things local. When I cooked it, it looked beautiful. I went ahead and took pictures. My photography flow was easy and the pictures were beautiful. I was so proud. Then I took a bite of the bread… It was horrid. The beer was strong and overpowered it. I used fresh jalapeños and they were bland in the bread. There was just no way I could share that recipe publicly. I couldn’t use the pictures either because they all featured the local beer. I scrapped that recipe and started over. I used a cheap beer I had in the back of my fridge and pickled jalapeños. Out came some of the most fantastic bread I have ate. What do you know? This is a great way to get rid of those cheap beers that are looming in your fridge from a party. The lighter tasting, the better. You want to be able to taste the sweetness of the bread, blended with the salty cheddar and jalapeños. This bread is good. REAL GOOD! My mistake will save you from wasting a good beer. You are welcome! 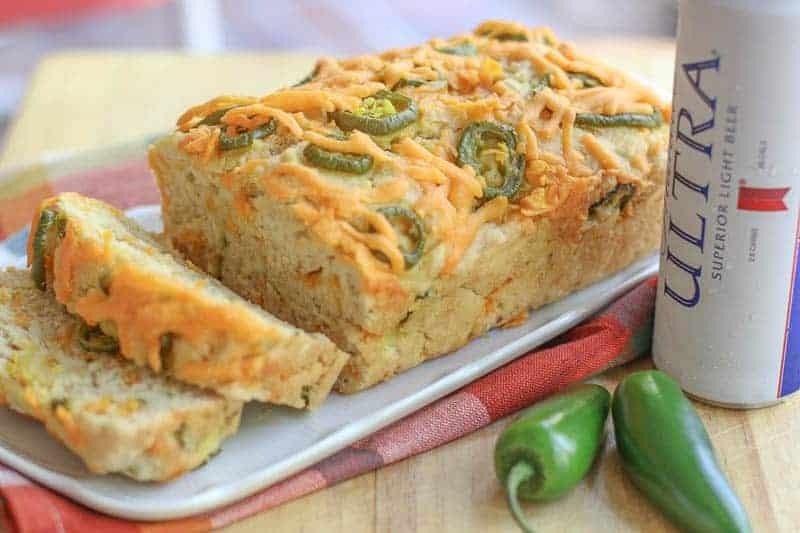 If you enjoyed this jalapeno cheese beer bread recipe, share with your friends and relatives. 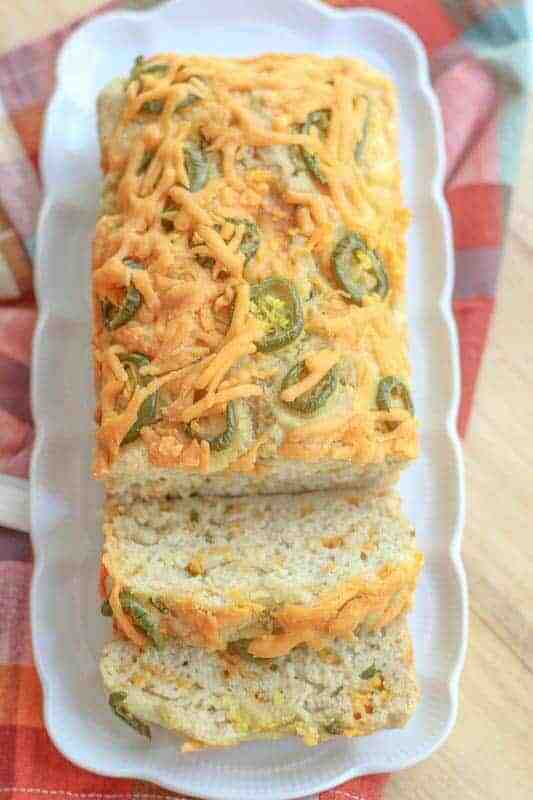 This Easy Jalapeño Cheddar Cheese Beer Bread Recipe makes the best homemade bread that can be made in the kitchen. This bread boasts a cheesy crunchy outer crust, moist on the inside and spicy all around. In a large mixing bowl, mix flour, baking powder, salt, and sugar. Fold in 1 cup of cheddar cheese and pickled jalapeno peppers reserving a few pickled jalapenos to add to the top of bread. Create a well in the center of flour mixture and pour beer into the center. Mix with spoon until the flour absorbs the beer being careful not to over mix. Dough will be sticky. Place dough into a greased loaf pan. Top dough with the remaining jalapeños and sprinkle on the remaining ½ cup of cheese. Bake for 60 to 65 minutes until bread is done. Remove from oven and allow bread to rest in pan for 5 minutes. Remove bread from loaf pan and cool bread on wire rack until completely cooled to retain moisture. Slice and eat after completely cooled. Yes. The beer acts as the yeast. If you use a light tasting beer such as miller or bud light, you won’t taste it in the bread. Do u have to put the beer in it? Not such a big fan of beer tasting in food. I don’t eat a lot of bread either, but I do really enjoy it and I definitely have to work hard on the treadmill if I want to eat certain things, lol. This one looks delicious and love the jalapeno/beer combo! Perfect on its own or with chili 🙂 Great photos! Looks so good Katie! I hear you about bread’s ability to love you back:) The answer is to drink more beer and then you cannot blame the bread any longer. Tried and true, lol!